Over 127,000 United States citizens were imprisoned during World War II. Their crime? Being of Japanese ancestry.\n\nDespite the lack of any concrete evidence, Japanese Americans were suspected of remaining loyal to their ancestral land. 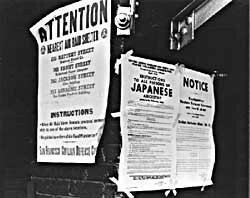 Anti-Japanese paranoia increased because of a large Japanese presence on the West Coast. Was the internment of 127,000 US citizens justified?